This Tuesday the Travel Channel was filming at Whitlow's owned Restaurant 3 for their bacon themed "Food Paradise" series. This was an exciting and busy night for the relatively new restaurant, especially with the warm weather and free pulled pork BBQ sandwiches attracting people to the outside seating. Restaurnt 3 offered a you-can't-get-enough-bacon themed menu, with bacon being an ingredient in the special three course menu, desert, and even a bacon infused drink! Pictured here is the pork chop main entree topped with yummy sauce and bacon bits. The dinner was delicious, and my fears about too much bacon would over take the food was unfounded. Even the bacon ice cream desert was great, with just a slight hit of bacon. Also bottles of wine were half price, and my glass of Merlot complemented the pig themed dinner nicely. Can't wait to see this local Clarendon venue on the Travel Channel! While enjoying the free outdoor concert and supporting the diversity of Columbia Pike and its businesses, shop and eat with nearly 30 local food, craft and other exhibitors, including Car Free Diet, Pike Ride, Big Daddy’s BBQ and Rincome Thai. 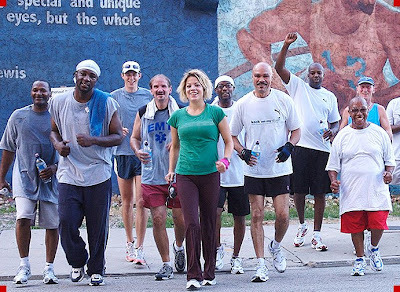 Come out to Rhino Bar in Georgetown tonight for a fundraiser to benefit Back on My Feet, a nonprofit organization that promotes the self-sufficiency of homeless populations by engaging them in running as a means to build confidence, strength and self-esteem. A show that should not be missed is Juniper Lane tonight at Iota. The very talented and energetic rock/indie/pop band is returning again to Clarendon after their last show here in February. Every time I've seen Juniper Lane play I've been seduced by lead singer Vivion Smith's amazing vocals and impressed with the band's their catchy and solid tunes. They put on a great show with lots of crowd interaction. Music begins at 9pm with The Silent Critics opening for them. 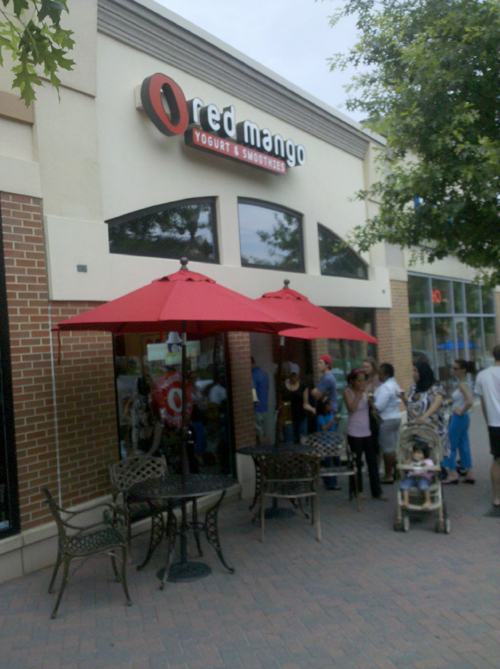 Today was the official opening of the Clarendon branch of Red Mango, a frozen yogurt shop dedicated to fresh and healthy ingredients. They were giving out free small cups of yogurt with one topping, and not surprisingly the line was out the door on this stuffy summer day. In the first of a new series of posts highlighting good dating venues in Clarendon, here is a much over due review of Spider Kelley's/the Ballroom's sister restaurant. Eventide opened last year and quickly became good competition for the renowned Liberty Tavern nearby. Its a three level wine lounge and classy restaurant very close to the Clarendon Metro stop. Eventide's personality changes depending on where you sit, as each of its three floors has a different menu. The ground floor is a wine bar and lounge, the second story is a formal dining room, and the roof is more casual and airy. Its a great date spot, as the great food and classy atmosphere make for good conversation starters. 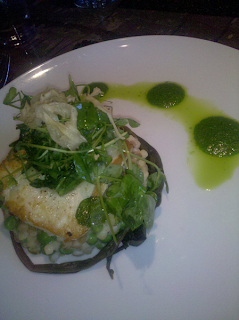 The Pan Seared Alaskan Halibut, pictured here, was beautiful and delicious on a bed of pasta balls and peas. 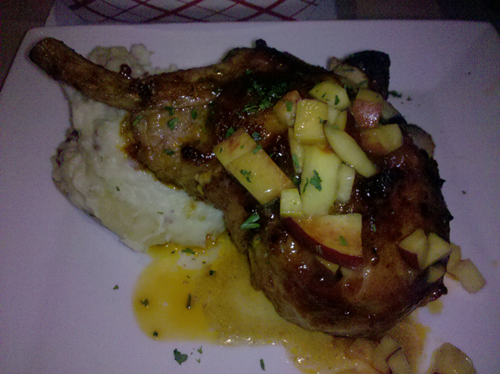 The Compart Farms Pork Chop is a more masculine choice, having excellent flavor and being served with spicy sausage and spinach. Expect a formal dinner for two with wine to run about $100, so it definitely is in the upscale dating venue category in Clarendon. But you could also have a more causal and less expensive date on the roof deck, if its open. Beware: reservations aren't accepted for roof seating, so its bound to be packed when the warm summer weekend nights arrive.